The first indigenously designed and built aircraft carrier, INS Vikrant, was launched on August 12, 2013. While still several years from being operational, the launch of the carrier, which has been designed to carry 36 fixed wing fighter aircrafts, comprising a mix of MiG-29K and the indigenous LCA (naval variants) in addition to Ka-31 AEW and ALH helicopters, will provide air cover to Indian Navy (IN) vessels. The launching of the hull of INS Vikrant with the power plant and generators integrated is the first step in the further development of the ship, particularly the weapon systems. This work is likely to consume the better part of two years before the ship can join the operational fleet. Only the UK, the US, France, and Russia have demonstrated the ability to design and build such ships. Reportedly, the second Indigenous Aircraft Carrier (IAC-2) is under design already. 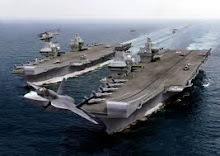 One particular feature of the aircraft carrier is that it does not plan to utilise steam catapults, like the US super carriers, for the launch of the fixed wing aircraft. Instead, the bow of the ship sports a ski-jump configuration, in which the aircraft rolling down the very short available runway on take off is lofted into the air like a skier.1 This will impose limitations on the type of aircraft operable. The IAC-2 is likely to have catapults for aircraft launch. The importance of air power at sea can not be overstated especially since the Battle of Coral Sea (May 4–8, 1942), in which two opposing fleets fought a major sea battle through the use of aircrafts launched from their carriers. Replacement of the battleship of yore with aircraft carriers, as the new capital ship, has been a strategic choice for the navies of the world since then. INS Viraat, currently the sole Indian aircraft carrier, operates British-made Sea Harrier2 fighters in addition to helicopters of various types. INS Vikrant’s MiG-29K fighters are modern fourth generation fighters that will provide the IN with state-of-the-art air defence capability through the use of advanced Beyond Visual Range (BVR) as well as Within Visual Range (WVR) missiles backed by advanced airborne radar and Infra-red search and Track (IRST) systems and excellent agility. The MiG-29K also has an anti-ship and anti-land target strike capability, which would help in vastly increasing the reach, safety and lethality of the fleets at sea. The IN has fielded an aircraft carrier since 1961.3 The original INS Vikrant served from 1961 to 1997.4 Aspiring to field at least two carrier battle groups (CBGs), one each for the western and eastern seaboards, the IN negotiated for induction of the erstwhile Soviet carrier, the deactivated Admiral Gorshkov, while also commencing to design an indigenous aircraft carrier. The contract for its transfer of Admiral Gorshkov involved extensive refurbishment by Russia. The refurbishment has faced extensive delays and cost escalations, though the vessel is reportedly now nearing readiness. The progress in the development of INS Vikrant indicates that India’s shipbuilding capabilities are maturing towards self-reliance in design and development of high-end naval vessels. At the higher end of naval equipment, the aircraft carrier and nuclear powered submarine are complex. By 2020, INS Vikrant should be ready for operational deployment and could be reasonably be expected to be joined in a few years by its sister ships that may include further refinements over the original design. Both INS Vikramaditya and INS Vikrant are expected to carry MiG-29K fighters, sourced from Russia, to be joined later by Hindustan Aeronautics Limited’s (HAL’s) Tejas (naval variant). By the 2030s, the IN should be able to field three CBGs giving it the capability to protect India’s interests at locations far removed from the coast. The increasingly “designed and made in India” nature of the IN’s fleets should provide strategic and tactical flexibility through total ownership of critical technologies and capabilities. Air power afloat as an integral part of the Indian naval fleets should provide these vessels assured air defence and fire power against surface targets at sea and on land. The IN has long aspired for a true blue water capability and the aircraft carrier project is a critical part of it. The IN has been involved in the project from the design stage onwards at the Cochin shipyard thus giving it total ownership. Also, the time and cost overruns in the indigenous aircraft carrier project are relatively minor. The Admiral Gorshkov’s refurbishment by Russian shipyards, with several decades of experience, stands as a comparison.5 The INS Vikrant is the lead ship of its class and future vessels of the same type, if built, should benefit from the from the construction process. India has major maritime interests. These arise from the fact that most of India’s foreign trade is carried by sea. India’s energy imports also come by sea. Therefore, it is important for the country to be able to provide security along these sea lanes of communication (SLsOC). Moreover, with an expanding economy, India requires to be able to access raw materials sourced from other countries along the Indian Ocean rim as well as further away. Thus India must be able to freely access the SLsOC to these regions. The Indian Ocean hosts some of the most important SLOCs including the Straits of Hormuz and the Straits of Malacca. In international waters it is critical to have capabilities to protect national assets, particularly the sea passage choke points. Naval fleets have the ability to stay on station for long and carry considerable integral firepower. An aircraft carrier bolsters the potency of naval fleets by deploying fighter aircrafts that can apply long distance power from their carrier. Carriers can provide intelligence, reconnaissance and other essential support functions as well. A carrier battle group thus enhances the power projection capability of its fleet manifold. The INS Vikrant signifies the coming of age of India’s ability to design and build major warships in the country and much to cheer for the indigenous defence industry. Moreover, it indicates that the IN is close to achieving capabilities to field forces at long distances in order to safeguard India’s maritime interests.